Our small team is making some kind of "mixed" style Adult game. You have two main characters for now, tanned neko and elf girl. Race affects possible class and equipment, for example elf warrior will be light agile fighter with longsword / rapier (duelist), while stronger catgirl will have 2-handed cleaver (berserker). Same applies for ranged classes, elven priest and cat shaman, and so on. A bit close to Might & Magic? Some of them will have their own scenes and will be able to temporarily join you party in battle, as story will progress. Dungeon itself is constantly changing, unstable structure. (randomly generated, yes). Greedy female adventurers are coming for both shiny gold and fun - not even bothering with heavy armors, since they're gonna strip anyway. 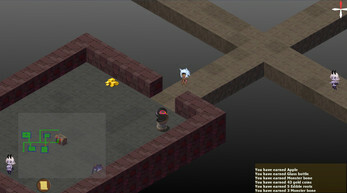 It is classic isometric with cute sprites and various awesome objects to explore and to plunder. And of course, it has various monsters and monstergirls to have tons of fun in battle mode. Some of them will have specific debuff attack to get your team in proper mood for various perverted things. It is still pretty early demo, but if you like it - please support us. Help make it more awesome! You can do this via Patreon. Any feedback or support is welcome. 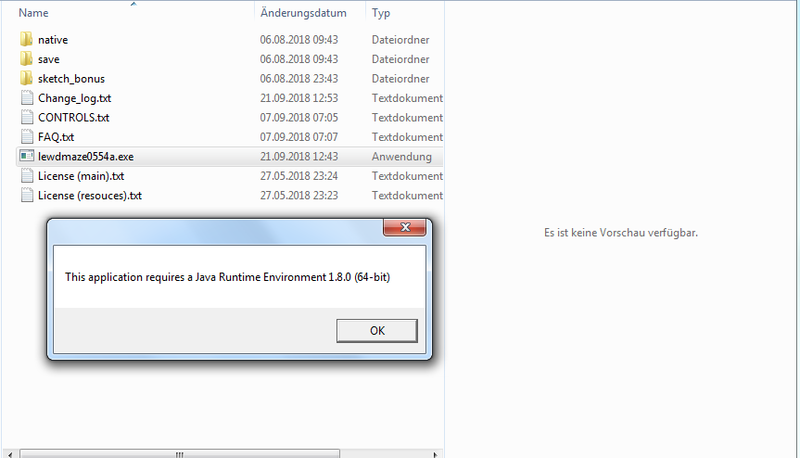 i have downloaded 64bit java and extracted the rar file. none of the executables inside are making the game go. what am i missing here? Like, what system do you have? Win, Mac, Linux etc. Or, how much memory do you have? Or do you have actual videocard, or integrated video? Main executable should launch black console thing - if you're on windows. Does it have any errors inside? i have tried opening the exe with administrative privileges and the cmd prompt opens up for a split second then disappears. It crashes after 6 seconds on the loading screen. You need to have Java64, 4+ gb ram, some videocard and not-blocked-by antivirus or windows defender. any plans to animate the lose scenes? Tbh, since we already have "H action" animated scene in battle, making pretty much same stuff for gameovers feels like overkill. the scenes in battle can't be enjoyed endlessly currently, and if ya animated the lose scenes at the same quality of graphics as the CGs are now, i may never win to a centaur again XD could also have varied game over animations, but in the end it's just an idea, the game is good as it is, but if you do that, this might turn into one of my favorites XD also wouldn't hurt to have a floor or two with things that aren't evn vaguely humanoid. 2nd stage is planned to have one of non-humanoid mobs yeah, leeches. ok so id like to try playing this game but unfortunately every time I download it shows up in my downloads tab as the internet explorers symbol and when I click on it it opens a tab for internet explorer saying downloads and makes another copy of it giving me the choice to save or open and if I already clicked save it gives me the chance to pick open with but I don't know what to open it with im on an HP laptop any advice? Thats rather messy. I would recommend using something more browser-like, Chrome or Firefox. Seems like your IE is messing up download process, for some reason. Also, it is pretty much an archieve, so you need 7zip or Winrar to unpack donwloaded file. no stairs on floor one bro? Its pretty early demo so we have only 1 demo floor for now. how many floors will the end product have? also any spoilers for the last two races? Other races will be mercenaries avaliable for specific levels. For example, for current 1st level you can hire Dwarf smith girl, if you finish her quest line - and she will have her own scenes cgs and animations, like team member. So other NPCs will also be avaliable for hire later on, for specific dungeon levels or quests. We plan to have 3 levels for Futa stage, and 3 levels for another dungeon segment with other type of H fetish. Still thinking if we should add some stuff like in-between stages, with same mobs but different decoration / loot or objects. cool, here's hoping that ya'lls cover completely non human monster girls, like chimera bug in monster girl quest. Itch download application messing up .exe file, for some reason - it is literally trying to unpack exe file content. Same thing are done by some bad archievers. Try to use manual download and 7Zip, and it should be fine. this is probably a stupid question, but where do i find the manual download? I see. Yeah you need 64bit Java. In 2 days i will release new public version, i will add 32bit support. I am still having problems figuring out how to start and open it and everything, I download it like all the other stuff here, but it doesn't give me an application or anything to use 3:. Try manual download and it should be fine. You just click on Download button, while having Itch downloader disabled. ist it possible for me to play this game with a 32 bit pc? It is recommender to use 64bit Java. Probably, it will run on 32 bit too.But cant say for sure if it will run without bugs. I am having problems too 3:, I got the 64 thing installed, but I can't find the application. WIN version does have .exe file. If your folder looks different from this screenshot, you're most likely having issues with unpacking tool. I suggest trying something like 7Zip. Yeah. For some reason, it seems to be attempting to unpack EXE file itself. So you see like "insides" of that exe file, instead of just unpacking main folder with it. Which obviously leads to error. Try 7Zip or WinRar. In that case you should contact Itch support, because their application clearly is doing something its not supposed to do. Its just archieve and non-encrypted exe file, why its trying to unpack it automatically is mystery to me.